I know this woman who always talks about not having enough money. Well, one day I decided to give her a gift. It wasn’t much, but something is better than nothing, right? Do you know what she said when I handed the money to her? I don’t need it. Trust me. This woman wanted that money and had someone else offered it, she would have taken it, but because it was coming from me, she rejected it. How sad it is to ask God to send you help only to reject it because it is coming from a person that you don’t like or from a person that you don’t want to receive help from. I’m realizing now that God has answered many of our prayers, but because it didn’t come in the form or in the person that we wanted it to, we rejected it. Sometimes pride is the thing that keeps us from receiving ‘answered prayers’. Pride says, I know what’s best for me. My plan is better. I can do it better than God. Too many me’s, my’s and I’s will lead to trouble. Do you remember the widow woman from Zarephath? She needed help. There was a famine and her husband was dead. She was a single mother preparing their last meal. Not only did she lose a husband, but she lost hope. She wasn’t just preparing a meal, but she was preparing to die. God heard, He saw and now He was sending help, but in the meantime He was dealing with her. Before the answer had arrived, God had already commanded the woman to do something (1 Kings 17:9). The widow didn’t know Elijah. To her, he was a stranger – and I think that was a good thing because sometimes we become too familiar with those who have rule over us and instead of honoring them as prophets of God, we treat them as mere men. Jesus didn’t just give men or women, but he gave gifts to the church (Ephesians 4:8). According to Luke 4:24-26, there were many widows in Israel during the famine, but God didn’t choose them. He chose a widow from Zarephath. He sent Elijah to a woman who was not his ‘own people’. Had it been another widow, she may have been like the woman at the well. Jesus answered, “You don’t know what God can give you. And you don’t know who I am, the one who asked you for a drink. If you knew, you would have asked me and I would have given you living water” (John 4:10, ERV). But that wasn’t the case with the widow of Zarephath. She recognized the gift of God. It was the same with the Pharisees. They knew the Old Testament scriptures. They read about the coming of the Messiah, but when He came, they didn’t recognize Him. He came unto His own and His own received him not (John 1:1). He didn’t look like what they were waiting for. He has no stately form or majestic splendor that we would look at Him, nor [handsome] appearance that we would be attracted to Him (Isaiah 53:2, AMP). He was called Beelzebub. Some thought he was John the Baptist, Elias or one of the old prophets. To them, He wasn’t the Son of God. He wasn’t the Savior of the world. He was just the carpenter’s son. And sometimes we are just like the Pharisees. When God sends us what we need or what we’ve been praying for or what we’ve been waiting for, we miss it. While the widow was gathering sticks, Elijah asked for a little water in a vessel. That wasn’t a problem. She could do that, but as soon as he asked for a morsel of bread – now that was a problem. First, she told him what she didn’t have. Then, she told him what she did have. I have not a cake, but a handful of meal in a barrel, and a little oil in a cruse. I’m sure Elijah knew she felt uneasy and unsure about giving him what he had just asked for so he told her to not be afraid. Fear not. Go and do as you have said, but make me a little cake first. It’s hard to trust someone you don’t know and this is one of the reasons why Christians struggle with trusting God. We really don’t know Him the way He wants us to know Him. Just because you grew up in church and you’ve read the bible from Genesis to Revelation, doesn’t mean that you know Him. If you knew Him, you would trust Him and if you trusted Him, then you would obey Him. The thing God is asking you to do (or give) is little, but it will bring about something big in your life – if you will trust Him. Elijah assured the widow that she would not run out, but that she would run over – but first, she had to believe. She trusted God with her last and gave it to the man of God first. Let each one give thoughtfully and with purpose just as he has decided in his heart, not grudgingly or under compulsion, for God loves a cheerful giver and delights in the one whose heart is in his gift (2 Corinthians 9:7). As a result of her giving, faith, patience and obedience, she, Elijah and her house ate for many days (1 Kings 17:15). Look closely at the picture above. 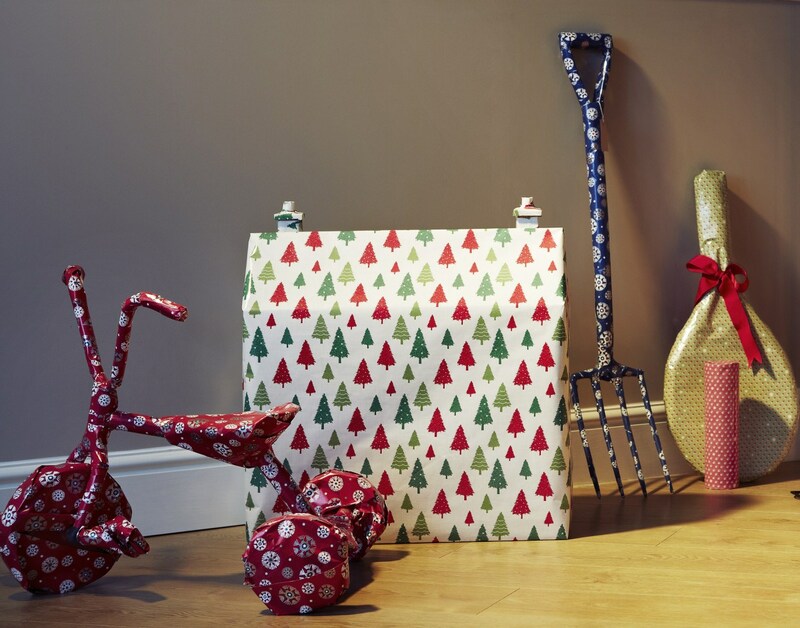 You can recognize what those gifts are right away because of their shape and form, but if they were disguised in a box covered with wrapping paper, you couldn’t easily recognize them. Many of us have rejected and walked away from blessings, breakthroughs and answered prayers because of the wrapping, but the gift isn’t the wrapping. That’s just the covering. That’s just flesh. The gift is inside of the wrapping. Prayer: One version of Isaiah 53:3 tells us that Jesus was looked down on and passed over. We admit today that there are still areas of our lives where we look down on Him and pass Him over because our evil desires and lusts look more attractive than Him. Create in us a clean heart and renew a right spirit within us. We repent of pride, self-sufficiency and self-righteousness. Father, help us to recognize the gift of God and help us to recognize You at work in our lives. Give us understanding where we lack it, in Jesus’ name. Amen. This entry was posted in Uncategorized and tagged gift, give, need, obey, recognize, reject, trust.